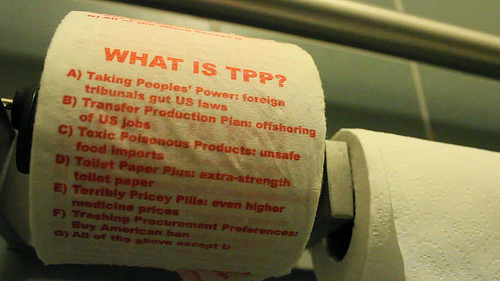 The newest step in the elite’s quest for complete globalization is called the Trans-Pacific Partnership (TPP). 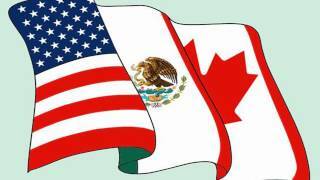 It is the newest of the “Free Trade” agreements from the same multinational corporations who gave us the General Agreement on Tariffs and Trades, (GATT), the North American Free Trade Agreement (NAFTA) and the World Trade Organization (WTO). This new TPP deal has been called NAFTA on steroids, and just another example of how these trade deals are never just trade deals. Of the 29 chapters in the TPP, only 5 of them have anything to do with trade, with the other 24 being hailed as a Corporate Wish-List. The rest set a dangerous precedent with an international tribunal to put an end to internet sovereignty. The TPP isn’t just NAFTA on steroids, it’s also CISPA on steroids. TPP will limit internet freedom by forcing Internet providers to act as copyright enforcers and cut off people’s Internet access. In fact, entire paragraphs from ACTA have been copied and pasted, word-for-word into the TPP completely verbatim from defeated cybersecurity bills. Whenever activists and communities cooperate and achieve victory together, lobbyists try again and eventually find a new way to undermine those efforts, thus sabotaging the will of the people. The defeat of SOPA (Stop Online Piracy Act), PIPA (Protect IP Act), CISPA (Cyber Intelligence Sharing and Protection Act), and ACTA (Anti Counterfeiting Trade Agreement) has accumulated in the realization that internet control will never pass if it is labeled as internet control. Although CISPA was temporarily defeated, these victories are all empty because nothing was put into place to prevent lobbying groups from trying to do it again, and the will of the people goes ignored. Ben Still reports that in realm of internet freedom, TPP incorporates the most draconian provisions of previous legislation defeated by congress last year that would grant copyright protections to corporate created internet content for 120 years. Internet Service Providers will be enlisted into a private snooping force empowered to monitor user activity and arbitrarily remove content or even prevent access to the internet altogether. TPP will limit internet freedom by forcing Internet providers to act as copyright enforcers and cut off people’s Internet access. It gives multinational corporations everything they’ve ever wanted to make it easier to control how people use copyrighted materials. Copyright law effects everyone on the planet under this deal, since the definition of “copyright” is widely expanded under this trade deal, demonizing truly innocent acts like ripping CDs onto MP3 devices. If the new TPP Tribunal find you guilty, they charge you in court with criminal damages. This amounts to sending people to prison for committing copyright infringements to including things that don’t even cost money, and would enforce mandatory permits to download anything and everything on the internet. Which brings us to the international court system that goes along with this. The TPP Tribunal consists of three judges (all appointed by private corporations), who would oversee Corporations suing governments and individuals for threatening profits. These Tribunals exist outside the normal courts and circumvent all national legal systems. In fact Eli Lily is suing Canada for 500 million dollars because Canadian government rejected drug patents hence preventing the sale of said pharmaceuticals. These kinds of cases are referred to as Investor State Dispute Settlements, meaning that a corporation can sue an entire nation for what it alleges is a loss of its future profits. 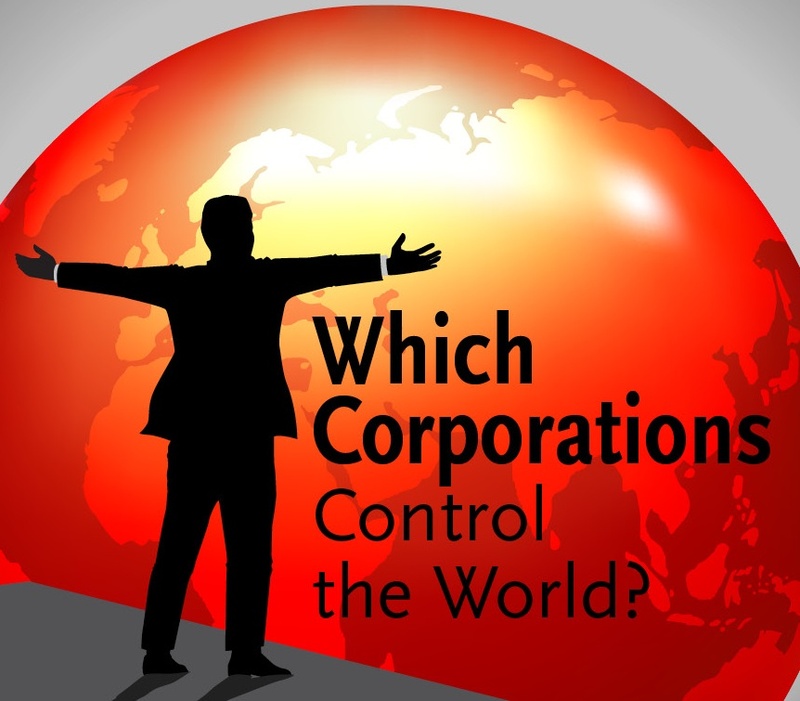 If the Tribunal rules in favor of the Corporation, the Companies gain millions of dollars and the public ends up footing the bill since government requires people to fund it. TPP would create a completely new set of rules regulating the economies of 12 different countries on four different continents, despite the fact that few of the people living on these continents have ever heard of any of this. TPP is a clever subversion to the United States Constitution, since Article 6 states that Treaties are the supreme law of the land. So ironically it would be theoretically constitutional under the TPP for US laws to be made to conform to provisions within the TPP, allowing corporations to sue entire governments if those governments interfere with corporate profits, even though all of this is blatantly unconstitutional. According to Public Citizens Trade Watch, TPP would allow private corporations to sue countries that pass regulations they don’t like, reward companies that send jobs overseas, and gut regulations that keep big banks in check. Dean Baker for Huffington Post contends that TPP is about crafting rules that will favor big business at the expense of the rest of the population in both the United States and other countries. Once banking oligarchs created the European Union, they set to undermining the national sovereignty of the entire planet by working to create a series of other unions, including the North American Union (NAU) which would have encompassed Canada, the United States and Mexico to form a borderless community with a single currency similar to the Euro: the Amero. NAU was signed into law by President George W. Bush under the Security and Prosperity Partnership (SPP), but was later shut down due to negative publicity. 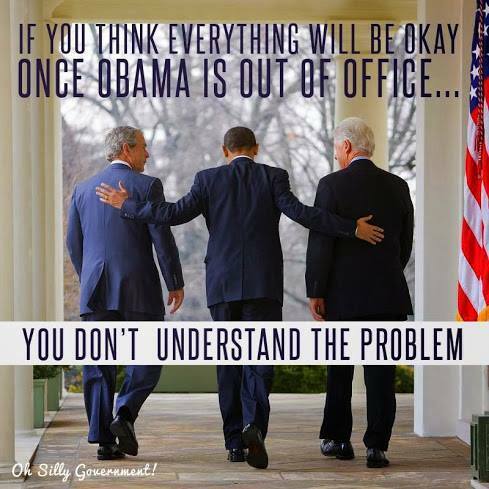 However, the TPP is everything that the NAU was going to be, only far worse and on a much grander scale. They’ve included the proposed North American Union into the larger TPP configuration that includes the three countries of the NAU alongside nine additional countries: Australia, Brunei, Chile Malaysia, New Zealand, Peru, Singapore, Vietnam, and China. WHY DO WE HAVE TRADE DEALS IN THE FIRST PLACE? 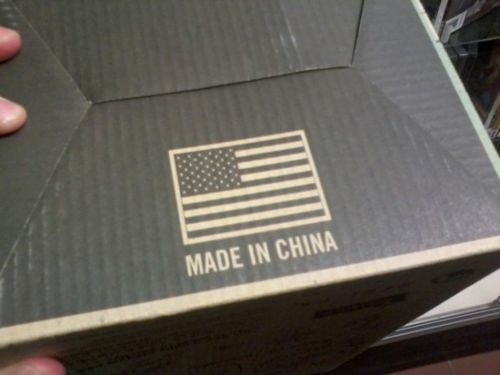 From America’s founding two centuries ago all the way up to the 1980’s, America’s economy was built on a system of Tariffs (taxes on imported goods) that protected American manufacturing businesses. Workers and businesses didn’t have to compete with cheap products or cheap slave labor from abroad. The American economy flourished until President Ronald Regan abandoned the tariff system altogether, thus ushering in the era of so called, “Free Trade.” But these trade deals are never just trade deals. And every president since has followed Regan’s lead, signing the United States into deals that are supposed to grow the economy, but instead lay waste to the industrial base. 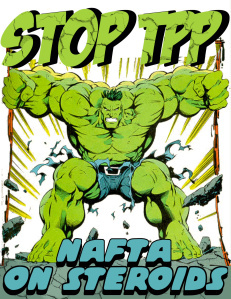 For example, on 3 December 1993 President Bill Clinton signed NAFTA into law after promising repeatedly that, “NAFTA means jobs, American jobs and good-paying American jobs!” NAFTA thereafter was directly responsible for sending 700,000 jobs to Mexico, undermining American industry. 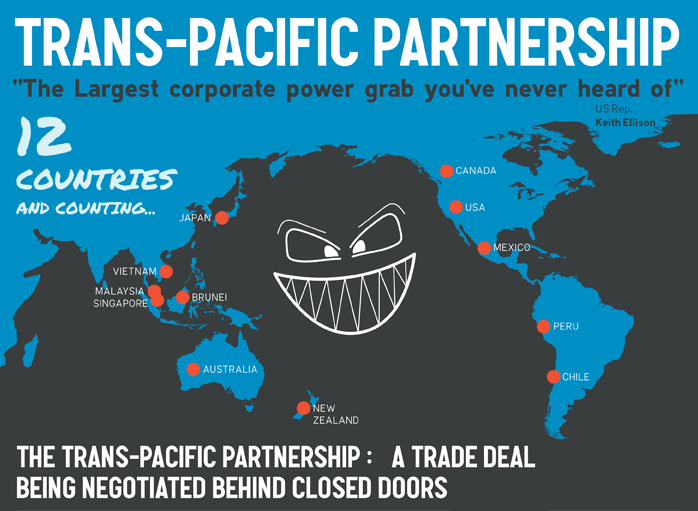 The Trans-Pacific Partnership likewise is peddled as a trade agreement while actually operating as Global Corporate Governance that is actually enforceable. The agreement requires that every signatory country conform all of its laws, regulations and administrative procedures, to 29 chapters of legalese, 24 of which set a whole new array of corporate privileges and rights, handcuff governments and limit regulations; a tool used by the .01% to shred what is left of our most basic needs and rights. They’re able to circumvent the rule of law by what is called, “Fast Tracking,” granting the authority of the US President to negotiate international agreements that Congress cannot amend or filibuster. 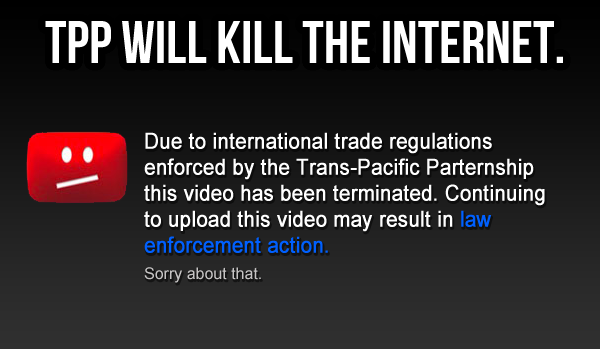 The Evil of the TPP doesn’t end with Internet Censorship or the Tribunals designed to regulate it. TPP expands the copyright language into the realm of patent law as well, granting corporations the ability to patent animals, which is the reason some have referred to TPP as the Monsanto Protection Act on Steroids. Even surgical methods fall into this which would forbid some doctors from performing life saving operations that are the patented intellectual property of the surgeon or doctor who invented them. 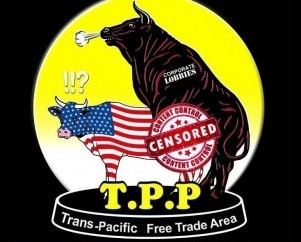 TPP abolishes environmental regulation, strips away health and safety regulations, and grants the corporate New World Order, Total Power to Profit. 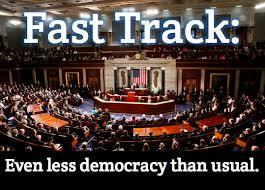 Ever since NAFTA destroyed America’s manufacturing base, trade agreements haven’t been exactly popular because they’re so catastrophic for the people, so TPP has been kept a closely guarded secret amongst 600 corporate lobbyists and the oligarchs they serve. All the major players from the military industrial complex one might expect, including defense contractors like Haliburton and fuel corporations like Exxon, are involved in this slow-motion coup d’etat. Everything is negotiated and handled behind closed doors, written in confusing legalese, and all without so much as the possibility of oversight or transparency. The vast majority of the rules in these trade agreements serve as delivery systems to undermine victories won by citizens movements, activism and advocacy groups in congress. 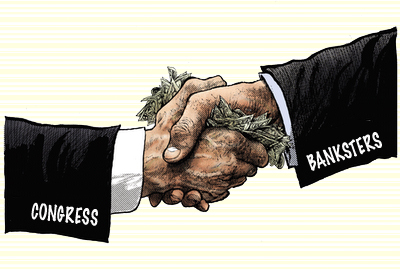 Lobbyists never give up because their funding is unlimited. Lobbyists make a career out of being lobbyists, because the corporations need mouthpieces to reconcile with the media to sell the public things it doesn’t need. They will never stop, and neither can we. The TPP is for now, the trade agreement to end all trade agreements and it is being negotiated and handled without our consent. The defense of our liberty requires Constant Vigilance because the people who are trying to make this world worse are not taking a day off. So how can we? This entry was tagged ACTA, CISPA, GATT, NAFTA, PIPA, SOPA, T-TIP, TPP, WTO. Bookmark the permalink. ← Who Crashed The World?